Gibbons describes the paper as rose. The local paper, The Fiji Times (founded in 1869) had been highly critical of Fiji's postal service which was organised unofficially by the Briish Consul. 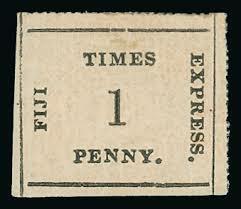 The paper established its own postal service on 1st November 1870 that ran efficiently alongside the delivery of newspapers through its agents on the various islands. The utilitarian designs were printed in four rows 6d, 1s, 1d and 3d. The service paved the way for an official government service which took over and began issuing its own stamps in November 1871. This sheet, a reprint, was found at Grosvenor Auctions. The lot description is below the image. I think it is closer to 5x8 than 4x10. 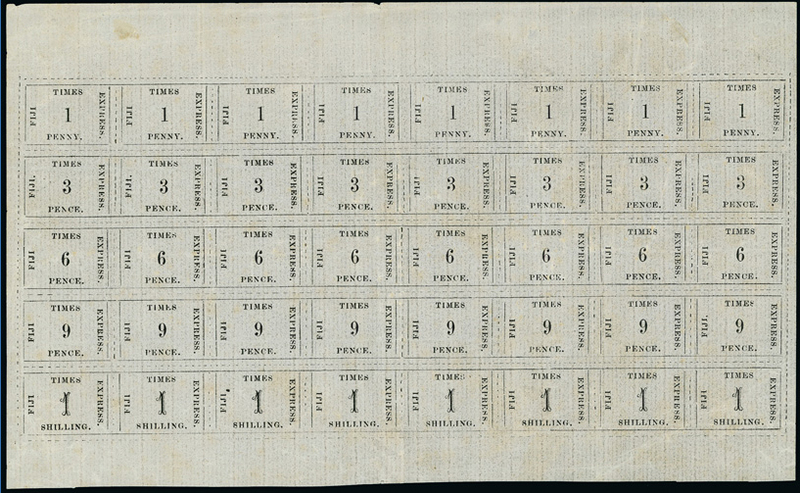 Fiji: 1870-71 The Fiji Times Express, First Imitations, very scarce complete sheet of forty (4 x 10) on white wove paper without gum, rouletted and with selvedges on all sides, comprising horizontal rows of the four values resulting in se-tenant vertical columns, some minor creasing and hinge remainders. Price Realised £420. 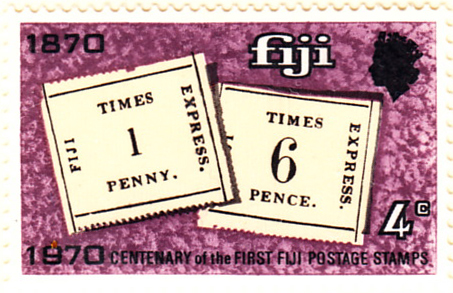 Fiji’s 1970 centenary commemorative set, depicting a range of stamps covering the GB monarchs during those years, provides an exemplar rarely equaled. Images from ebay and Grosvenor Auctions.